He’s cute, he’s adventurous, he’s reliable, and he’s closeted. What more could one ask of a folding bike? 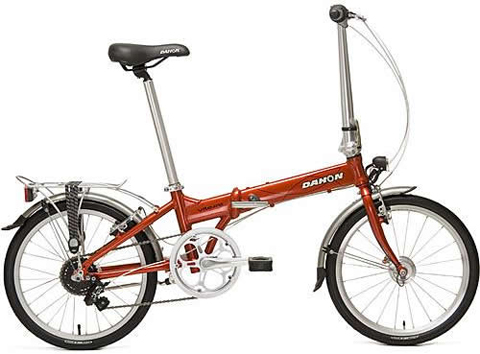 My latest love interest is the Dahon Speed 7. I’d been eying him in the bike store for quite a while, examining his features, and comparing him with his strong-framed brothers. Finally, in the beginning of February I decided he was the one for me. The Dahon – or “Speedy”, as I’ve come to call him – is the latest stage in the shift I’ve been making away from private ownership of a motorized vehicle. Now I look at the Vespa I bought two years ago as a way station on that path, and I’m planning to sell it once spring arrives in full bloom. Last September I had to give up running because of foot problems. I was accustomed to getting around the city on foot, Metro, and bus, so originally I thought the folding bike would be mainly for recreation or workouts. But in the three-plus weeks I’ve had Speedy, I’ve used him a lot more than I’d expected for errands, and for getting to business meetings and dinner engagements. This February has been a relatively mild winter month by Washington DC standards, and Speedy has given me the freedom of the city in a way that I really hadn’t expected. The day I bought him I took him on a one-hour-plus ride up the Capital Crescent Trail to Bethesda, hung around the bookstores there for a while, then had the great pleasure of riding downhill all the way home. I’ve taken him to Capitol Hill; I’ve taken him on lunch dates; and on a particularly nasty evening with freezing rain I took him on a dinner date to Georgetown. He makes going to the Post Office or doing other routine errands a whole lot more fun, and personally I think there’s a certain cachet to arriving at meetings with a bike helmet tucked under my arm. Between the backpack and the luggage rack, Speedy can easily haul home enough groceries for five days. Washington DC has become much more bike-friendly since I lived here in the 1980s and 1990s. There are many more bike lanes now, and bike racks seem to be a standard part of the sidewalk furniture in every street rehab project. A large proportion of the buses have bike racks too, and the Metro allows riders to carry on bikes at any time except rush-hour. Folding bikes, however, can be carried on even during rush-hour, but they have to be enclosed in a bag. They can also be carried as hand-baggage onto Amtrak trains, so I can bring my new bike on any trip I take up to New York City. Full disclosure: My husband still has a car, and he is generous in both letting me use it and even chauffeuring me to and from various carpool arrangements, and Amtrak and Greyhound stations. So my weaning away from car-dependence is still far from total. And yes, I think he approves of my new affair with Speedy! Tags: cycling, Integrated Transport, United States, walking, Washington, D.C.